Surround your children in safety with a trampoline safety enclosure. Fits the 9x15 or 8x14 Texas Trampolines. Steel poles are coated for corrosion resistance. Shock-absorbing padded poles and advanced safety net flex on impact. All parts designed to withstand UV and weather exposure. Easily assembled with small hand tools. Printed instructions included. One year limited warranty. *Colors may vary. *** Trampoline sold separtely. 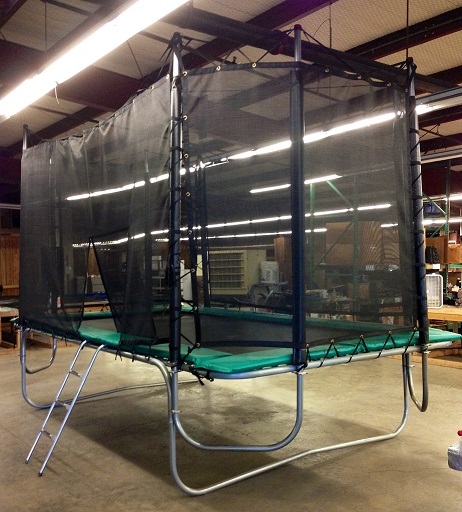 Fits the 9x15 or the 8x14 rectangular Texas trampoline. PLease note: This is the safety enclosure ONLY! TRAMPOLINE SOLD SEPERATELY! Vinyl sleeve color is Black. Call us for other color options.